"Scrubs" your colon and keeps it free of disease-causing sludge & invaders for incredible health, energy & regularity! 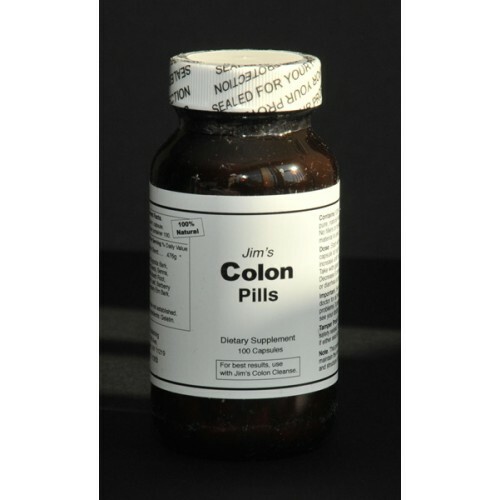 "90% of all disease comes from an unclean body"
"Death begins in the colon"
"Poor bowel management lies at the root of most people's health problems"
Recommendation: Jim’s Colon Pills capsules work best when used in conjunction with Jim’s Colon Cleanse. Take one Colon Pills each morning and evening with one Colon Cleanse each morning, enough to have 2-3 bowel movements each day. Increase or decrease as needed. No preservatives or artificial ingredients!